Update, April 17, 2019: Project contractor Womack Construction will connect new water and sewer lines for the new building during the week of spring break (April 22-26). Close coordination will be necessary, as a section of road will need to be closed to enable installation. Update, Feb. 1, 2019: Phase one of Expansion 2020 is complete. The project will now move into phase two, which will erect a new building adjacent to the current hospital. This is the building for which the Nov. 27 groundbreaking was held. Update, Nov. 27, 2018: The community and hospital leaders broke ground on the new addition today. Click here for details: stph.org/GroundbreakingExpansion2020. Update, Nov. 2, 2018: The parking phases of our 3-year, $100 million expansion are nearly complete, and the public bid for construction of new patient addition on the main campus was awarded to Womack, general contractors out of Baton Rouge. Outpatient rehabilitation services have been relocated to our brand new STPH Wellness & Therapy, 1 N. Azalea Dr., so demolition of the Riverside Building is scheduled for the first week of November. That will enable the last step in the parking expansion to commence. Groundbreaking for the new patient addition will be Nov. 27, 11 a.m.
Update, Jul. 11, 2018: Thanks to all that attended the June 13 meeting regarding our expansion. We deeply appreciate your interest and time. We have completed improvements to the parking project including the speed bump at the exit, bushes bordering the lot and daily securing of the gate lock. Security cameras are on order and will be installed once they are available. We anticipated our next step to be presenting our site plan for review at the July Planning and Zoning meeting, but now anticipate an August timeframe to allow time for our new CEO to start and for the impact of school resuming to be included in our traffic impact study. Update, Jun. 7, 2018: New west campus parking is open and in use, as is construction worker parking east of Tyler. Phases left to complete include relocation of rehabilitation services to Flower Estates. With regard to that final parking construction phase, changes are being implemented to address concerns from neighbors concerning landscape, noise and safety. To ensure a prettier gateway into Covington for neighbors and visitors alike, St. Tammany will embellish the initial landscaping plans along Tyler St. Additionally, to address noise and aesthetic concerns from the construction worker parking, STPH will plant bushy, natural shrubs that blend attractively into the adjacent wooded buffer area. Security officers are now actively monitoring the parking lots and documenting adherence to locking and unlocking schedules at the Riverside lot. Security cameras have been ordered and will be installed as soon as available. STPH has determined an advantageous location for a speed bump to better ensure employee adherence to full stop before exiting the Riverside lot into the Harrison/7th Ave. intersection. Installation will be scheduled as soon as materials are delivered. Update, Jan. 24, 2018: the contractor is installing fill in the riverside lot . Trucks will stage around peak traffic times to minimize impact on adjacent streets. We apologize for the inconvenience and appreciate your understanding as the project progresses. Update, Jan. 4, 2018: the contractor resumed work this week on both work sites (east and west of Tyler St.). East of Tyler, soil removal will continue for the next few days with grading and fill to follow. West of Tyler, grading and installation of fabric and stone base will be in progress for the next few days. 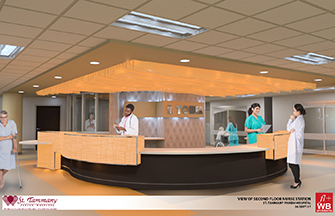 St. Tammany Parish Hospital announced expansion plans for a phased construction project 2017 through 2020. St. Tammany Parish Hospital worked with FL+WB Architects and OptimaLogix Consultants to develop a comprehensive master facilities plan to steer strategic direction for the next five to 15 years. 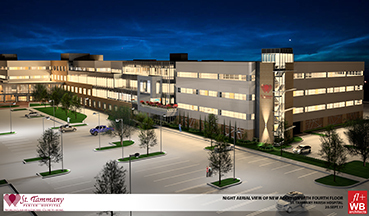 The resulting plan centers on increased capacity for private rooms, parking, critical care, obstetrics, interventional cardiology, imaging and surgery. The patient care space will increase private patient rooms for critical care at the main hospital, while parking will be added both east and west of Tyler St. Initial activity will occur west of Tyler St. along 8th Ave., Tyler St. and Polk St. Later phases will expand parking east of Tyler St. at Harrison, removing the Riverside Building. Click here for a PDF of the architect's drawing of our campus with highlighted sections where the new parking is going. After parking phases are complete, the project will focus on building flexibility for future use and eventual repurposing of the oldest structures in the main hospital. To allow uninterrupted care in existing spaces within the hospital, the expansion will occur as a three-story addition attached to the hospital. If needs warrant, the plan could allow a fourth story shell space to be part of this strategic plan. The hospital has added units of all private rooms repeatedly in the past three expansion projects and remains committed to building new private-room units going forward. As new units of private suites are put into use caring for patients, hospital construction teams will retrofit older units of semi-private rooms, ultimately emphasizing private-room environments for inpatients. A fourth floor shell space was part of the Millennium Project, which tripled the size of STPH in the early 2000s. That shell became the hospital's first Healing Arts Unit in 2008 and presently houses the Neuroscience Unit. Such long-range planning may be included this time as well. Analysis of the bed need reveals a growth trajectory through 2030, rounding out around 245 beds in the 12-year projection.